In 2015 Pease & Curren customers made 35 percent more for their diamonds using Direct Buy. Pease & Curren, a precious metals refiner/recycler for over a century, has enhanced its Direct Buy Diamond Buying Services. Direct Buy is available to all Pease & Curren customers who use our stone removal program to remove and refine reclaimed jewelry with stones. Direct Buy is truly a value add service for customers. Now twice per month, North American diamond buyers come to Pease & Curren to blind bid on customer’s stone lots. 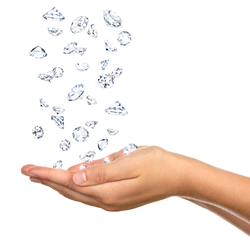 Unlike other diamond buying services, Pease & Curren does not purchase and resell the diamonds. The check is issued directly from Buyer to Seller. 3 Top Buyers blind bid making for very competitive bids. No obligation to the customer. You may choose not to accept any bids if you wish. Save man hours on marketing your own stones. Be assured of getting the best price possible. Pease & Curren will securely hold your merchandise until customer release. No shipping or traveling to shows to sell and risking loss. Experience NO RISK diamond selling. Last year Pease & Curren customers received 35% more for their diamonds by using Direct Buy.